Youngstown State senior Jenna Cavanaugh is the Horizon League's Preseason Defensive Player of the Year, and classmate Missy Hundelt is a preseason all-league honoree, according to a poll of the league's coaches. Cavanaugh led the conference with 1.23 blocks per set last season, which was also the sixth-best average in school history. She finished with 115 block assists, which tied for the second-most in school history. 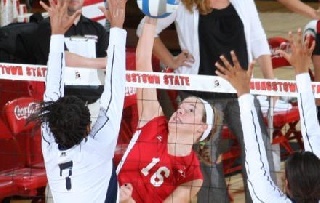 Cavanaugh set a school record with 13 blocks in YSU's match versus UIC last September. Her defensive efforts helped YSU hold opponents to their lowest attack percentage in the rally scoring era. Hundelt was predicted to repeat as an all-league player after ranking fourth in the conference in kills per set with 3.42 per set in 2012. The first Penguin to earn all-league mentioning since 2009, Hundelt had a career year as a junior with new highs in digs per set (2.89), blocks per set (0.57) and hitting percentage (.244). She is one of only three returning players in the conference coming off a season with at least 300 kills and 300 digs. Milwaukee senior Rachel Neuberger was voted the Preseason Offensive Player of the Year, and she was joined on the preseason all-league team by Hundelt, Panthers teammate Kayla Price, Valparaiso's Morgan Beil and Ellen Vanden Berg, UIc's MaryKate Imrie and Cleveland State's Dayna Roberts.